Kylemore Abbey Fishery is located between the mountains of Connemara, County Galway and the Atlantic Ocean. It consists of the Kylemore, Middle and Castle lakes and five and a half miles of the Dawros River which enters the sea in Ballinakill Bay. 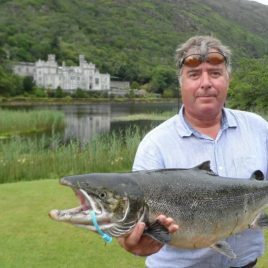 Hidden away between the mountains of Connemara and the Atlantic ocean, the Kylemore Abbey fishery is a wild and beautiful place. The open panoramas of the lakes contrast with the intimacy of the river to give a variety of fishing combined with stunning scenery unrivalled anywhere in Ireland. Salmon and sea-trout run for a good proportion of the year to provide first class fishing on uncrowded waters. Kylemore Abbey Fishery consists of the Kylemore Middle and Castle lakes, with five and a half miles of the Dawros river which enters the sea in Ballynakill bay. The fishery has been in the care of the Benedictine sisters since they came to Kylemore Abbey in 1922, and has recently been under a programme of refurbishment. Access to all the beats has been improved, new boats and engines have been bought, new pools and walkways have been constructed and we now have a fishery office.